I just received the new DoodleFactory Oh Baby! 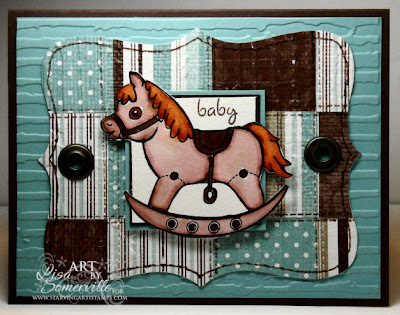 and Sentiments, who doesn't love to make baby cards! For this first card, I cut squares (1-1/2" x 1-1/2") from the Parisian Breeze Specialty paper, adhered them to a piece of White card stock, then cut with Stampin' Up! 's Top Note Die. After punching, I ran it through my Big Shot using the Distressed Stripes CB Folder to give it some dimension. I used my Close to Cocoa Journaling Marker to add the stitching using the Drywall Stitching Technique. TIP - when doing this technique, place a ruler in the middle of your drywall tape where you'd like the stitches to be, it helps keep your stitching straight. The focal image was colored using the Marker Watercoloring Technique, and the Out of the Box Technique. I popped this up on dimensionals on my quilt piece. Added some Jumbo Eyelets, then adhered to a piece of Baja Breeze that was also run through the Big Shot using the Distressed Stripes folder. This second card, also uses images from the same DoodleFactory sets. Here I randomly stamped by diaper pins in Baja Breeze on white card stock. , then again in Pacific Point on the Baja Breeze Panel. The Oh Baby sentiment is stamped in Black on Baja Breeze and cut with Nestabilities, layered on a Pacific Point Scallop cut with Nestabilities. The baby was stamped in black on white card stock, stamped again on Walk in the Park DSP, I cut out the baby clothes and paper pieced them to the stamped image. This image was punched with the 1" Circle Punch and adhered as shown inside my stamped image. I added some Silver Stick on Gems to the Pacific Point strip. 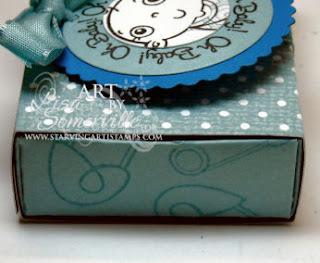 My last project today using these same images is the Matchbox - just the perfect size for a Baby Shower, or a small piece of jewelry for the baby. I used my Big Shot, the SU Matchbox Die and Baja Breeze and Parisian Breeze Speciality Paper to create the Matchbox. (Note to self - order the new Big Crease Pad) Before folding in the flaps on the box, I stamped some Diaper Pins in Baja Breeze. I created the tag for the box the same as the above card. I died some White Taffeta Ribbon with Baja Breeze Ink, punched a hole with the Crop-a-Dile, then tied it around the box. If you weren't the luck winner of the DoodleFactory Oh Baby Blog Candy from Starving Artistamps - you can order yours today and save 10% when use use code savetenls. Discount is good on all DoodleFactory and Starving Artistamps stamps. Oh my goodness are these cute. The colors and stitching on the first one is amazing and the baby one is just so darn cute. Lisa, these are all sooo cute!! I really like the baja papers with this set!! This are all so adorable, Lisa! 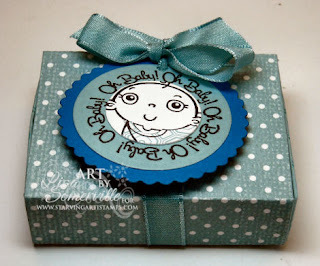 What wonderful baby cards, and that box is just perfect for a baby shower favor!